The GDS accessibility team has had a busy few months preparing for an influential upcoming law. 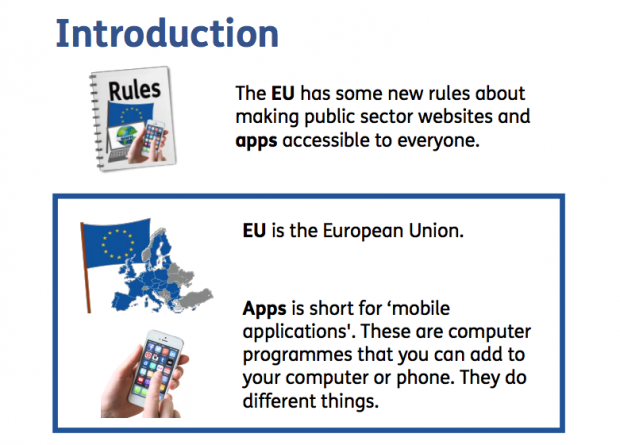 The Accessibility of public sector websites and apps: new duties and regulations, which comes into effect on 23 September, states public sector websites and apps must be accessible to all users, especially those with disabilities. Part of our preparations included a consultation to give users a chance to respond on the regulations. It’s always the aim of GOV.UK to be as accessible as possible, and specific GOV.UK guidance on consultations says it should be targeted to the audiences affected. Therefore, this consultation and response needed to be published in accessible formats. To do this, we worked with a content designer to make the wording understandable, provided multiple ways to respond and provided a British Sign Language (BSL) and Easy Read version. We also made sure the online survey was accessible. GOV.UK content should always be written in plain English, so a content designer helped turn some of the policy-heavy wording into simpler language. For instance, we changed some headings to show more clearly what would be affected. ‘Summary’ went to ‘What is this consultation for?’ and ‘Timescale’ changed to ‘When the changes are planned to happen’. Ideally, a content designer should work on the consultation wording from the beginning, rather than editing it down once it’s been written. We also published it in HTML, rather than PDF, to increase the accessibility of the consultation. We previously blogged about why content should be published in HTML and not PDF. BSL is the most common form of sign language in Britain and has a different structure and syntax to the English language. We provided a consultation overview, information and questions, the means to respond and the response in BSL. Easy Read is a format that uses pictures to support the meaning of text. It uses short sentences and simple words to focus on the core information. It was developed for people with learning disabilities to clearly understand information. We provided an Easy Read version of the Consultation Overview, Consultation Information, Consultation Questions and Government Response. We used a company that created Easy Read documents from stock imagery as we found the costs of illustrations was significantly higher. There were multiple ways of responding to the consultation questions – an online survey, by telephone, through BSL video or e-mail. Providing people with choice is always a positive for accessibility. It was helpful for us to use an online survey tool as it made analysing the data more efficient. We made sure the tool we used had performed a web audit on accessibility and had acted on the report. 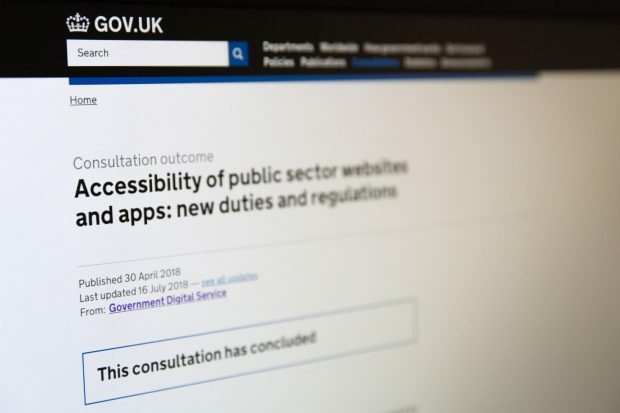 The audit tested against the Web Content Accessibility Guidelines 2.0 AA – advice which explains how to make websites accessible for disabled and older people. When choosing which tool to use, look into the accessibility of a platform as early as possible and always ask for evidence to support a company’s claims. The person running the consultation must understand its target audience. This will help determine the format it’s published in and how people can respond. A consultation with a broad audience should be made as accessible as possible using the different formats. With a narrower audience, consultations must offer an alternative version, if requested, within a reasonable timeframe. We also found it’s not possible to publish all formats of the consultation at the same time. Consultation wording is often not signed off until the last minute, and you cannot create your BSL or Easy Read version without this official confirmation. We were able to publish the HTML version immediately, but had to explain to the audience that BSL and Easy Read versions were still to come to manage expectations. Easy Read usually takes a few days, and BSL one to 2 weeks, to create a translation. But we decided it was better to give the majority of people longer on the consultation, than to delay publication while waiting. We found the Easy Read version was helpful to a lot of respondents and not necessarily just for those with learning difficulties. It was read as a quick and simpler version. When content is accessible, it helps everyone. We are always keen to improve, so please let us know of any examples of accessibility consultation best practice in the comments. If you would like more information about this work including costings please email accessibility@digital.cabinet-office.gov.uk.